Entertain the kids during the morning commute with this Sylvania swivel-screen portable DVD player. It easily clips on your car's sun visor, so you can stow it away when not in use. 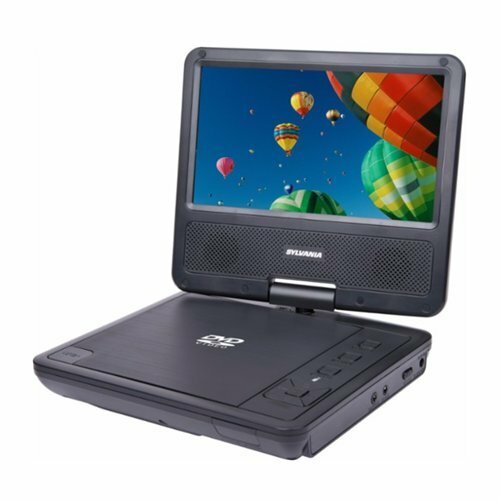 This Sylvania swivel-screen portable DVD player has a 7-inch screen, letting everyone view on-screen content, even from the back seat. Playback formats Include CD-R/RW, SVCD, DVD±R/RW, DVCD, DVD, CD and Video CD for flexible options. 7" LCD display Offers a compact viewing area for watching movies on the go. Built-in rechargeable battery For up to 2.5 hours of playback time.